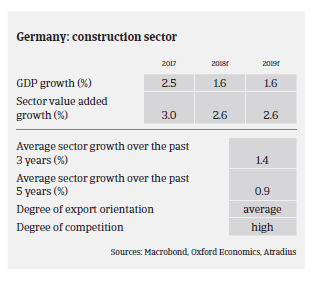 In 2018 the German construction sector continued to perform solidly and the outlook for 2019 remains positive, mainly driven by a robust order situation in the residential construction segment, but also in public construction. While market competition has decreased somewhat (until recently many companies had to specialise and to operate in niches in order to survive), it remains high. 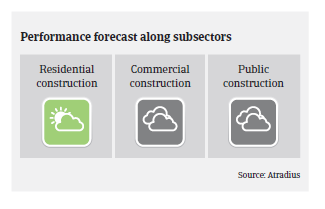 Due to the benign demand situation and robust price increases most construction businesses were able to improve their profits over the past few years, and the profit outlook for 2019 remains stable. The dependence of German construction businesses on bank finance is not overly high, given that payments in advance or instalment payments by investors are a major source of financing. 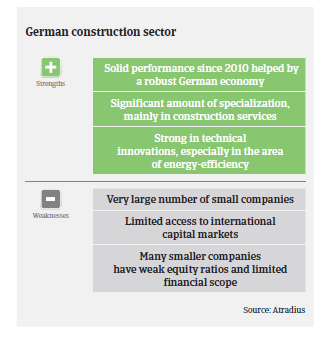 On average, payments in the German construction sector take around 45-60 days. With demand increasing and profit margins having improved, payment delays and insolvencies have decreased in recent years, and are expected to remain stable in 2019. However, despite the more benign situation we still consider the construction sector to be riskier than other industries, as the proportion of non-payment notifications and credit insurance claims is still higher than in other German trade sectors. We still observe higher claims in some segments related to interior and finishing work, such as building installation, plastering, painting and glazing. Those activities are usually due at the final stage of building projects, and are therefore more susceptible to budget constraints of the awarding authority. Another reason could be the lack of commercial skills in those mainly very small businesses. Due to the good performance of the German construction and construction materials sector in the last couple of years and the promising business outlook for 2019, our underwriting stance for the industry remains quite relaxed. 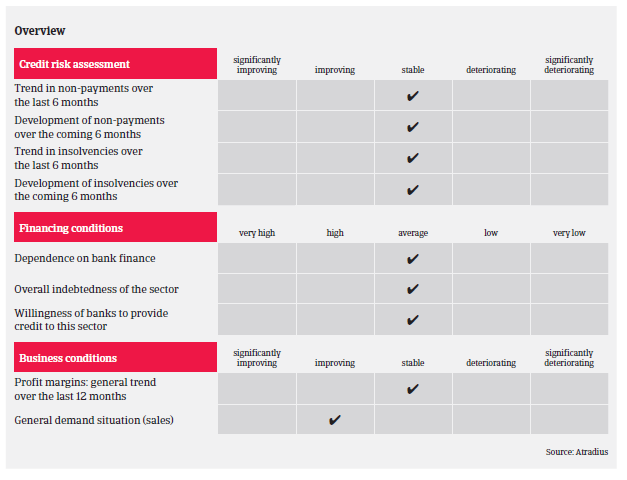 In general, when assessing buyer risk we take into account operating results, equity, liquidity and financing (e.g. the ratio of work in progress/advanced payments) and orders in hand. However, we are more cautious with the above-mentioned interior work-related segments and businesses that are mainly active for public customers (road, railway and other infrastructure construction). Those often face delayed payments by their clients, which could put a strain on their liquidity. With less background information to work with, we are naturally very cautious when assessing the creditworthiness of construction/construction materials businesses that have operated for less than one year, unless they are part of, or a spin off from, a larger group.